THEY set sail out of Liverpool on 1 April and, for 31 days and nights, they bonded aboard the Ceramic. A ship normally reserved for sheep and lambs was now carrying a different type of beast. The Lions of 1950 arrived into Wellington Harbour in early May. They were the first team from these shores to visit New Zealand in 20 years – and they were feted. Fourteen Welshmen, nine Irishmen, three English and five Scots, four of the five now dead, the last being Gus Black, 87 years young and 88 tomorrow. He is sitting in the front room of his home in Lundin Links, overlooking the water and surrounded by books, some of them holding pictures of Black in his pomp, rifling a pass away from his position at scrum-half or sniping in attack, as was his wont, the Lions jersey on his back all the while. He has shirts from the first two Tests in 1950, a 9-9 draw in Dunedin and an 8-0 loss in Christchurch. One hangs on the wall of Edinburgh University, his club of old. The other is with his granddaughter in Cheltenham, a lawyer at GCHQ, government intelligence. The jersey, says Black, is in safe hands. 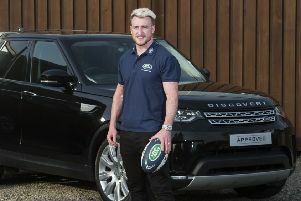 On Tuesday, Stuart Hogg became the youngest Lion in the 2013 party to Australia and Black sits here at the opposite end of his life as the oldest surviving Scottish Lion. “All ahead of him,” he says of Hogg. “All ahead of him.” With Black, it’s all 60 years and more in the past but time has not dimmed the memory. His recollection is as sharp as could be, his story beginning not in 1950 but 1946 and a game in Murrayfield against the foes he would later face in New Zealand. The men in black who came to Scotland that January were not the All Blacks, but they weren’t far off. They went by the name of the New Zealand Army touring team but they had greatness in their ranks, no question. Many of them had either played or would soon play for their country in an official Test and standing as their colossus was Fred Allen – or The Needle as he came to be known in his storied years as coach of the All Blacks – who played 14 matches during his reign and won all 14. Up until 1947, Black’s appearances for Scotland didn’t go down in the history books. These were not official Test matches, rather they were called Victory internationals, played out of respect for the fallen in the Second World War, some of whom were rugby players, some of them great ones. That changed for Black in 1947 when he made his “debut” for his country on New Year’s Day in Paris. Even now it makes him wince and there are good reasons for the pain. The France team of the late ’40s was a ferocious band of men, a pack that was monstrous and that had no compunction about kicking merry hell out of an opponent, particularly an opponent like Black who was quick, whose passing was slick and who needed to be sorted out in a certain fashion. We are talking here about the two lock forwards, Alban Moga and Robert Soro. Moga was known as Bambi. Irony was alive and well in 1940s France. Three years later, though, the offer came – and Black didn’t know what to do with it. He was not long married and not long a father, he was still at Edinburgh University studying medicine – he was a psychiatrist for 34 years before his retirement in the mid 1980s – and was torn by his family and his books on one hand and this great mystery tour on the other. He was advised to consult, so he went to see the professor of anatomy at Edinburgh who told him “Dear boy, you must go with the Lions”, the professor of bacteriology who said the opposite and another anatomist who could see pros and cons on both sides. For company, he had his Edinburgh University half-back partner, Ranald Macdonald. The pair had an instinctive understanding of each other’s game, forged on the training fields of Craiglockhart under the tutelage of Charlie Usher. There were times when Black and Macdonald trained blindfolded, Black launching passes into the darkness for Macdonald to run on to and catch even though he couldn’t see where he was going. They were of the same mind, these two. This is where the regrets of 1950 begin. Macdonald was selected as a three-quarter, not a half-back. Black’s partner for the first two Tests would be Jack Kyle, the icon of Irish rugby. Black kept his place for the second Test but that was when things really started to go wrong. The New Zealanders had a force of nature in their back-row, a destructive flanker called Pat Crowley who had no intention of letting a little Scottish scrum-half make the kind of break that almost did for the hosts in Dunedin. “To some extent I was always targeted in my career. I don’t think the average wing forward would think his day had been well spent had he not tried to take a chunk out of my thigh or ripped my ear off. But Crowley was very good. I spent most of my day getting tackled hard. I was up in the air more often than I was on the ground. Crowley sorted us all out. And what memories he has in his mind’s eye.